The latest entry in Activision’s annual toys-to-life video game franchise has that new car smell. Skylanders: Spyro’s Adventure — The original toys-to-life game. Elemental-coded action figures (or tiny statues, if you will) required to pass certain challenges in the game. Skylanders Giants — Now with bigger, more expensive characters required to pass certain challenges in the game. Skylanders Swap Force — Now with special mix-and-match characters with travel powers required to pass certain challenges in the game. Skylanders Trap Team — Now enemies can be trapped and played with using special totems (most sold separately) with bigger, more expensive elemental-code characters required to pass certain challenges in the game. Notice a pattern there? Each new installment arrived with fresh new ways to ensure players purchase as many toys as possible to complete objectives scattered throughout the games’ levels. Trap Team launched with challenges that could only be completed by figures that weren’t released until three months after the game proper. Skylanders Superchargers doesn’t follow suit. Its gimmick, if you can even call it that, is the introduction of land, sea and air vehicles as toys that yes—are required to pass certain challenges in the game. The key here is that only four toys are needed to complete every main story objective in the game—one Skylander figure and one each of the three vehicle types. Unlike every game that’s come before it, there are no elemental gates in Skylanders Superchargers’ story mode. Players need not worry about owning a figure from each of the series now ten elements—Earth, Fire, Water, Air, Life, Magic, Undead, Tech, Light and Dark. Those have been replaced with Land gates, which are required playing (since the core game comes packed with a car) and Sea and Sky gates, which are completely optional. It’s quite liberating, not having to constantly switch characters. After a bit of experimenting, I completed the main game using four toys exclusively. I call them my posse. Rather than quick and dirty ten minute affairs, regular levels in Superchargers are massive affairs split into multiple chapters. Most feature at least one Land, Sea and Air mission each, along with the normal puzzle platforming action the franchise is known for. Here’s an entire play through of one of the game’s earliest levels, the Cloudbreathers’ Crag. Harnessing the power of a mysterious force known as The Darkness, Skylands’ resident villain Kaos (voiced by Invader Zim) has kidnapped the ancient wizard Eon and blocked the power of the summoning portal. The mildly heroic Flynn (Patrick Warburton) and company discover the only way to use the portal is via vehicles outfitted with something called a Rift Engine. As we join the adventure, out heroes hope to gain audience with an ancient dragon in order to determine where Kaos has Eon squirreled away. I’ll break things down by time code. 1:30 — The action begins on foot. Just as developer Vicarious Visions introduced jumping to the franchise with 2013’s Swap Force, here the Skylanders finally gain the ability to jump and attack at the same time. The new characters, like Fiesta here, all have unique powers and abilities, which is a pretty good trick for a game with a couple hundred playable characters. 3:15 — An excellent example of one of the subtle puzzles scattered about the Skylands. No telegraphing, no one shouting “Hey, I bet you could open that door if you rang those gongs in the right sequence!” We’re smart kids. We can figure these things out. 6:05 — Here’s our first driving moment in the level. Driving segments are generally a mix of distance races and arena battles. I prefer the former to the latter—arena battles can get a little chaotic. The vehicles handle quite nicely though, with a drift turbo mechanic similar to that found in just about every modern kart racer. 10:35 — Rank up! The new Portal Master ranking system treats the player like an RPG hero, gaining experience and unlocking new powers and talents as they level up. 12:20 — Under the sea. Every boat is a submersible in Superchargers, and boy do I hate these underwater levels. The controls are imprecise, I’m never quite sure where I am going and no one really enjoys an underwater level. Give me water races over diving deep any day. 15:45 — Our first game of Skystones Overdrive. It’s a simple card game the builds on the one included in last year’s game. It seems pretty simple, but some of those cards are massive jerks. 27:06 — It’s a road race once more, but this one takes place in a very peculiar place. Remember that ancient dragon I mentioned? The big fellow also forms a large portion of one of the game’s multiplayer race tracks. 30:45 — We finally take to the skies to defend the Dragon Temple (a temple built on a dragon) from the forces of Kaos. Outside of fixed courses flying is a bit too loose for my taste—I need more control—but it’s still pretty exhilarating. And that’s a single level of Skylanders Superchargers. That’s a lot of stuff in one level. Mind you it’s not all Cloudbreather’s Crag. The story pacing is a bit off, and Vicarious Visions made some odd level decisions. There’s a particular moment later in the game, sandwiched between a pair of rather spectacular level creations, that’s just a simple series of rooms. No vehicle points, no amazing goings-on—just a series of rooms with the odd battle or puzzle. But for the most part Superchargers squeezes all the life it can out of the action platforming genre, using clever mechanics to create some amazing moments. Your Skylander will shrink and grow, use magnets to push and pull their way through puzzles and dynamically alter entire levels by participating in optional air and sea missions. And then there’s the Library. I won’t spoil too much about the library. I’ll just leave this here. You don’t have to watch it. Outside of the main story we have the return of the Skylanders Academy, where players can train their Skylanders, modify vehicles, play a little Skystones, participate in challenges or put their rides through their paces on expansive test tracks. This playground also serves as the gateway to the game’s competitive online racing mode, where four players (or one player and bots) can vie for position across a handful of colorful courses and modes. Playing against game developers and PR representatives in pre-release matches watch great fun, though it remains to be seen how much the community embraces the competitive multiplayer in a series that’s never featured it before. The game also features online multiplayer co-op between friends, but none of my friends were playing pre-release, which was sad. But don’t cry for me. I’ve spent the past few days enjoying some of the finest action platforming this side of a Ratchet and Clank title. 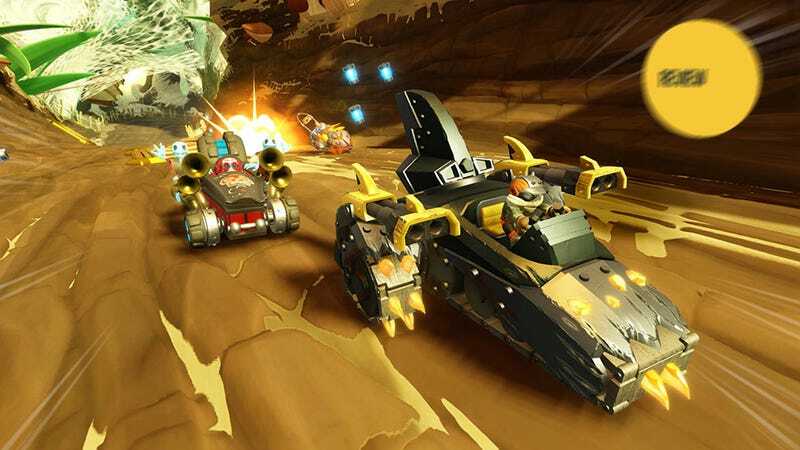 Multiplayer notwithstanding, Vicarious Visions latest foray into the Skylanders universe has resulted in a wondrous combination of fighting, driving and flying that I’d recommend without a single piece of colorful plastic in play.